With the big-screen debut of The Justice League just hours away, I wanted to spotlight my favorite origin of the iconic team. Over the next few days, the world will discover whether Zack Snyder has created a new benchmark in superhero filmmaking or delivered a dead fish (insert Aquaman joke here). I’ve spent most of March talking about comic book movies; before I hang up my comic book geek hat for a while, I want to highlight what has up until now been the standard by which I judge Justice League stories. 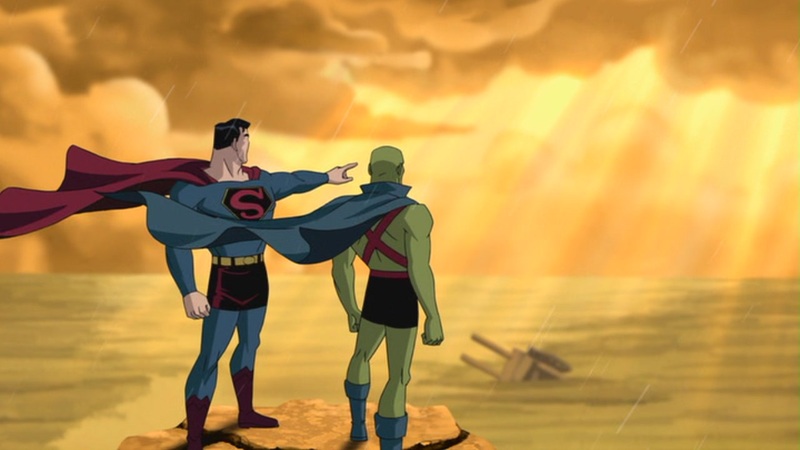 Justice League: The New Frontier from 2008 was the second entry in the DC Animated Universe, coming on the heels of the previous year’s Superman: Doomsday, a tepid adaptation of Superman’s death and rebirth that attempted (and failed) to cram a year’s worth of comic stories into 78 minutes. The New Frontier fared better. 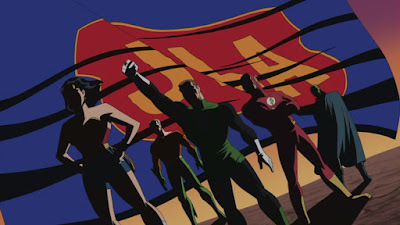 It’s an adaptation of a six-issue limited series which was essentially the work of one man, writer and artist Darwyn Cooke, who won an award for his efforts. You may recognize Cooke’s name from his work on Will Eisner’s 1940s character The Spirit, which Cooke brought back to the mainstream a year or so before Frank Miller’s 2008 cinematic flop. Cooke has achieved a reputation as the guy who understands retro, and was on the cutting edge of the movement that would eventually lead to TV shows like Mad Men and 11.22.63. In fact, my elevator pitch to you is that New Frontier is JLA meets Don Draper. Cooke’s story takes place between 1953 and 1961 and oozes mid-century cool and style. His goal is to bridge the gap between the Golden Age of comics (the World War II era, which featured more grounded villainy such as robbery, arson, etc) and the Silver Age of comics (when the costumes were colorful and the villains were frequently out of this world, literally). 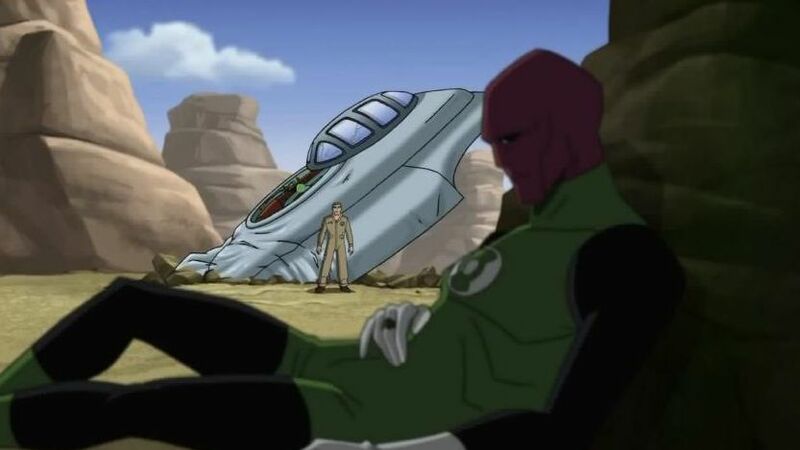 Justice League: The New Frontier seems intent on legitimizing the goofy stories of the 1960s by giving them appropriate social and political context, and I think it succeeds on all fronts. The movie approaches the overall formation of the JLA by focusing on a few key characters rather than all of them. We’re first introduced to Air Force pilot Hal Jordan on the battlefields of The Korean War as he’s shot down behind enemy lines and must fight for his survival. Before he ever becomes Green Lantern, we’re deeply invested in Hal Jordan as a human being and want him to survive. Next we see a scientist accidentally capture a Martian named J’onn J’onzz, trapping him on a rapidly changing planet Earth that he can’t possibly understand. The other main character we’re introduced to is Barry Allen as he matches wits with the villain Captain Cold in the streets of Las Vegas. Along the way, we also meet Superman, Batman, Wonder Woman, Green Arrow, and even Aquaman, though it’s Hal, J’onn, and Barry that serve as our main eyes and ears in this world. Before they are heroes, they are flawed but noble people doing their best…except for the one that’s not a person at all because he’s from Mars. But you get what I mean. It’s easy to take all this for granted now. We have successful television shows for Green Arrow and The Flash, and even Green Lantern got a movie back in 2011. You have to keep in mind that when this story was first introduced (2004 for the comics, 2008 for the film), Hal Jordan hadn’t been Green Lantern in the comics for years. The character of Barry Allen who now anchors his own show had been dead in comics for two decades. Comics had moved on from these characters, and the entire Silver Age of comics was often looked at with embarrassment, a goofy reminder of the silly sixties. Darwyn Cooke didn’t think the sixties were silly, though, and his story succeeds at offering a revisionist perspective on characters that had become a joke. I think Cooke has a profound understanding of these characters and what makes them tick. Considering that most of these heroes have been around for 75 years or more, there’s a certain amount of bending and updating that can be done to them without breaking them, but there’s also a core that any writer must remain true to in order to really connect the audience to the character. The greatest writers can elevate the exploits of four color superheroes to an artform, and I think that’s what Darwyn Cooke does with this story. 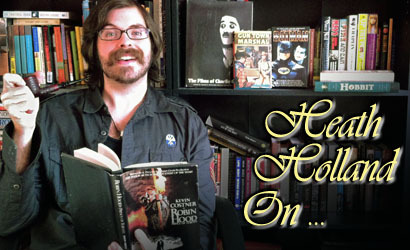 He puts lines into the mouths of the characters that feel both iconic and true. It’s no coincidence that this has perhaps my favorite Batman line of all time, which he directs at Martian Manhunter. As cheesy as Wonder Woman’s invisible plane is today, this movie does something with it that I’ve never seen before and makes it awesome. Justice League: The New Frontier is brimming with historical context and relevance. The tumultuous years of the late 1950s and early 1960s are captured—as well as they can be in an animated movie geared toward a wide audience—in this movie that uses the civil rights movement, the fight for Women’s equality, and even the Cold War as the stage for the superhero drama. The titular “New Frontier” takes its name from a speech given by John F. Kennedy as the world changed and moved into what we all hoped would be a better reality. Because of the themes of progress and optimism, the film focuses on the effects these heroes have on the world around them as much if not more than the heroes themselves. There are great character moments, but they’re part of the bigger picture. What The New Frontier seems to be saying is that we need heroes that we admire and look up to. The journey of the characters in the film parallel the journey of society as it pulled itself up by the bootstraps and endeavored to be better. New Frontier has perhaps the most star-studded voice cast that any of these DC Animated Universe movies have ever been graced with, with David Boreanez, Miguel Ferrer, Neil Patrick Harris, Lucy Lawless, Kyle McLachlan, Phil Morris, Kyra Sedgwick, Brooke Shields, Jeremy Sisto, and Keith David lending their voices to the project. The screenplay is written by Stan Berkowitz, whose work goes back to Batman’s 1990s TV adventures, though he sticks closely to Darwyn Cooke’s original story, with Cooke himself getting a consultant credit. Just like the animated adaptation of The Dark Knight Returns is oozing with Frank Miller’s voice, this adaptation retains Cooke’s unique visual style and words. Justice League: The New Frontier is that rare story that transcends its medium and ceases to feel like a cartoon. When I first finished reading the comic book version of The New Frontier years ago, I closed the book and sat for 10 minutes in silence. There was just so much to think about, so much that had been challenged. I’m happy to report that the animated version of the story retains many of the things that I love from the original source material, making for a truly moving and powerful experience. By the end of this movie, the viewer has been introduced to an entire comic book universe full of heroes, villains, soldiers, scientists, aliens, dinosaurs, and monsters. This is the folklore of a generation, maybe two generations, and it’s done with respect and the appropriate iconic imagery. I can’t speak for how it will affect others because the genie is out of the bottle for me. I can’t put the toothpaste back into the tube and go back to a time before I had been impacted by New Frontier. I can only tell you that I love how much it loves the Justice League. Nice piece. I really do love this movie a whole bunch, and I was supposed at some of the scenes they left in (the scene between Hal and the Korean pilot, Faraday's last scene) as this was the first DC animated film I saw. It's always a little jarring to hear Batman not voiced by Conroy, but I got over it quickly. If BVS: DOJ strikes a tone more The New Frontier and less Man of Steel I will have myself a wonderful weekend indeed. Chances seem slim to none but JL is much like pizza to me. Oh boy, is The New Frontier comic good. It's just so shiny and hopeful and you're right - Darwyn does a great job capturing those characters, their personalities and their motivations and he takes the time to focus on the smaller moments too, with impeccable timing. Just terrific. I didn't know they had adapted this into a movie, but I'm glad you think it's a good adaptation of the original material.